Seagate sub LaCie has revved its Fuel Wi-Fi external storage capacity from 1 to 2TB and claims it's the highest capacity wireless 2.5-inch drive on the market. It can provide a Wi-Fi accessed storage resource for iPads, iPhones, iPod Touch, Macs, Android mobile devices (v2.3 or later), the Kindle Fire, and Windows 8, 7, and Vista devices. Files can be dragged and dropped onto its icon on desktops/laptop systems, which see it as an external drive. Larger files can use the supplied USB 3.0 cable to speed their transfer. The thing sets up its own Wi-Fi network and can link to five devices, streaming video to three of them. It can output media files - video, audio and photos - to an Apple TV and thence to a connected HDTV, as well as to AirPlay-compatible speakers. But, be warned: if the video is a 1080i or 1080p file, it might require too much bandwidth and cause a choppy viewing experience or not play at all. 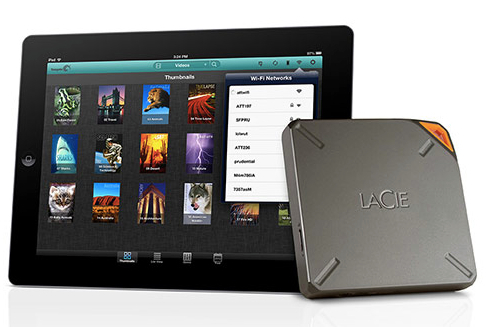 LaCie says purchase a lower-quality video or use a program to change the file to a lower quality. Hmm – not that good. There is no HDMI link to playing devices so that potential bypass is not available. You can have a Dropbox folder on the Fuel and use Dropbox to transfer and sync files with it. A supplied Seagate media app can move files from desktops/laptops to the Fuel and can provide syncing services. Seagate has a 1TB Wireless Plus external Wi-Fi accessed drive available for $139.99. We expect a 2TB one to pop up shortly.